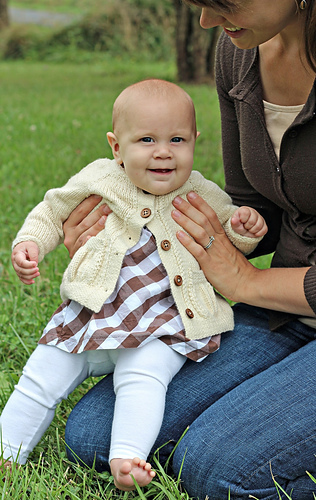 This cardigan is a lovely addition to any baby girl’s wardrobe with its classic silhouette and feminine puffed pockets. Since it has seamless raglan construction, it’s also a lot of fun to knit! Beginning at the neck, you work the yoke in one piece, split the sleeves at the underarms, and continue the body to the hem. 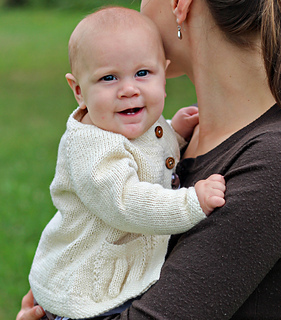 The linen stitch trim (collar, button bands, and bottom band) is all worked with the body and even the pockets are knit (instead of sewn) to the front. No seaming! Just weave in ends, sew on buttons, and you’re done! Techniques used: k2tog, SSK, M1L and M1R, LT and RT, Linen St, picking up stitches, and working in a round.